Indian Point: Even if you don’t live in New York, you’ve heard of the controversy surrounding this dangerous powerplant. The fight to shut it down has been going for years, however most people first heard it’s name on the news after the September 11th terrorist attacks. The planes flew right over it that morning and it has been reported that Al-queda groups have blueprints of the plant. If you try to look it up on a satellite map today, you will find a big blacked out spot. In the 2002 State of the Union address, the President said: “We have found diagrams of American nuclear power plants in [terrorist camps].” According to Riverkeeper, a January 2002 report showed that only 19% of security guards at IP-2 felt prepared to repel a terrorist attack. Aside from its national security risks, it is an environmental nightmare. Few people know about the extent of the damage it is causing to New York. There are three reactors at Indian Point. Only #2 and #3 are on-line. Indian Point has a capacity of 2,000 megawatts of energy. IP-2 has the worst safety rating of all 103 reactors in the US. 25 gallons of radioactive water leaks from the spent fuel pool each day, usually into the Hudson River. This also affects mercury levels and other toxins in marine life. According to Riverkeeper.org, they store 1500 tons of high-level radioactive waste on site. -By law, New York must have an energy capacity surplus of 18% of what the state needs. – Because of infrastructure limits, NYC must generate 80% of its own energy. – The blackouts that have occurred in Northern Manhattan and the Bronx in recent summers were because of outdated transmission systems unable to handle sudden demand for energy on hot days, not because of lack of energy supply. – NY now has the two largest wind farms east of the Mississippi. – Two townships in Westchester are now powered in part by wind energy. – Rockland and Westchester counties have adopted responsible energy conservation initiatives for all municipal buildings. – Government buildings in Utica, Binghamton and lower Manhattan (EPA offices) are powered by wind energy. 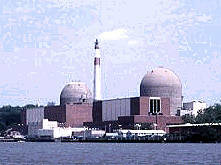 – After a serious accident in 2000, both Indian Point-2 and -3 were off-line for the majority of the peak energy season without rolling blackouts. Aside from the lack of necessity Indian Point provides, it has an obscene number of work orders backlogged, meaning there are millions of dollars worth of repairs needed for it to run safely, but Entergy (the corporation who owns/runs it) will not spend the money to make the repairs despite its potential to melt down if left neglected for another decade or two. -This study was commissioned by the NRC in 1982 to evaluate the consequences of meltdowns at all working US reactors. – A meltdown at Indian Point-2 would result in 46,000 near-term deaths and 141,000 near-term injuries. – A meltdown at Indian Point-3 would result in 50,000 near-term deaths and 167,000 near-term injuries. – A meltdown at either reactor would cause $500.5 billion worth of property damage in Westchester ALONE! Homeowner’s insurance policies do not cover nuclear damage. 1997 BROOKHAVEN NATIONAL LAB STUDY – A disaster at the spent fuel facility could cause anywhere from 1,500 to 143,000 cancer deaths. – A spent fuel disaster could cause from $800 million to $560 billion in damage. – A spent fuel disaster could render as much as 2,700 square miles around the plant uninhabitable. The second portion of this article will be coming soon, so stay tuned! Dena Marie Kelly is the Assistant Editor of Merlian News. She is a published poet and creative writer. Dena volunteered as an environmentalist with the New York Public Interest Research Group (NYPIRG) for three years serving as a project leader, an intern, and a board representative. She has a BA in Liberal Studies from SUNY Purchase College. PreviousRescued Elephants Need Your Help!